﻿This association is organized to promote and encourage the exchange of information,education, responsibilities and professionalism of the Technical Assistant to the Construction Official. Our membership is open to all Technical Assistants and/or Control Persons to the Construction Official. Your membership is paid through your dues if you belong to one of the local associations. Our history started in 1994 with the creation of the Bergen-Passaic Association; from there the South Jersey Association and Ocean-Monmouth Association were started. In 1997 the Northwest Jersey Association and the Union Association started, with that the executive officers of each association started to meet as a group and so the New Jersey Association of Technical Assistants was established, following quickly was the Central Jersey Association and the Northern New Jersey Association which had joined us during the spring/summer of 2005 bringing us to a total of seven (7) local associations in addition to our state association. During the economic downturn many towns consolidated and reduced hours. This had the biggest effect on the Northern New Jersey Association which after trying for several years to stay together finally dissolved. Their members that were left joined neighboring associations. So today we we stand at six (6) local associations and our State Association. We roughly have 180 members in total. One of our goals is to utilize some of the many benefits available to us as an ICC Chapter. Some of those advantages include having a Staff Liaison to assist us in communication with ICC Staff and the Board of Directors, encourage Chapter support and participation at all levels, attend our meetings, etc. In addition there are educational benefits such as one day of on-site training for a minimum of 30 people, a Telephone Seminar for up to 10 sites, or an on-line course for up to 50 members. Congratulations to Lisa Love, Tabernacle Township our 2018 Technical Assistant of the Year! 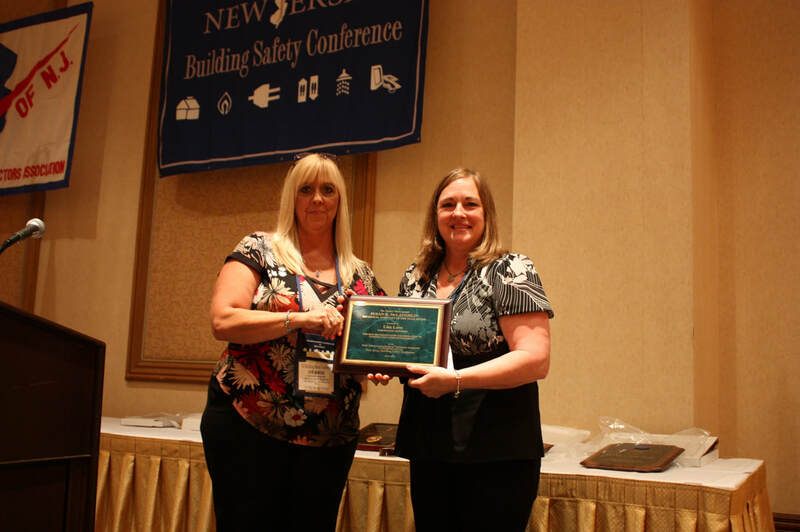 Pictured from L-R: Debbie Simone, SJTAA President and Lisa Love, TA of the Year. We hope that you will find this website as a useful tool, such as information exchange, meeting dates, regional association contacts, job postings, etc. Please contact us with any information, comments or suggestions you would like to share.